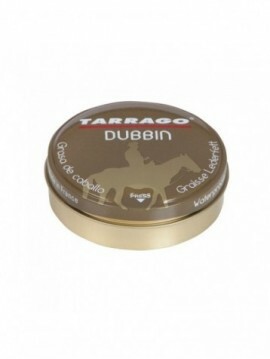 Crema Medalla D'Or tarro cristal 75ml. 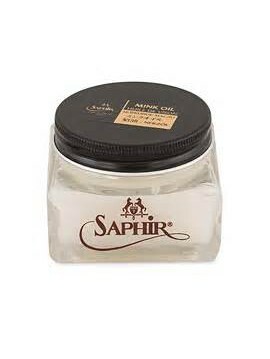 Nutritious original cream dating from 1925, developed based on 7 waxes, solvent (turpine…) and she butter oil, to clean, nourish, refreshen the colour and waterproof. Download here available colors. 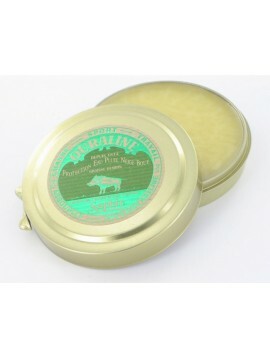 Non-greasy cream based on beeswax, mink oil and lanolin. Gently cleanses the skin, nourishes, cleans, protects and polishes. Paste de Luxe Medalla D'Or 100 ml. 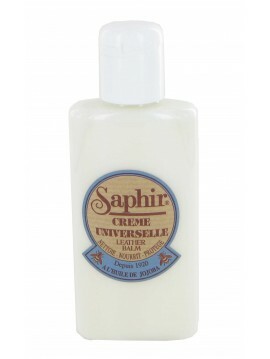 100% natural cotton, perfect for applying creams on fine leathers. For the finish, provides shine. 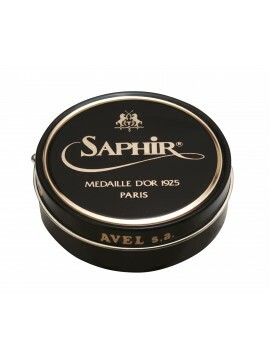 Paste de Luxe Medaille D'Or 50 ml. 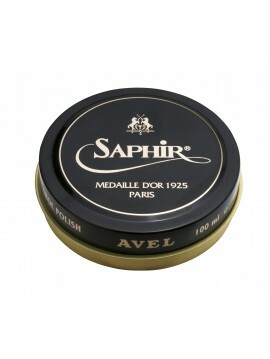 For superior shoe polishing. Based on beeswax, this formula will nourish, revive the colour and help to waterproof the leather.Alternate with wax polish for the best shine and leather care. Download here available colors. 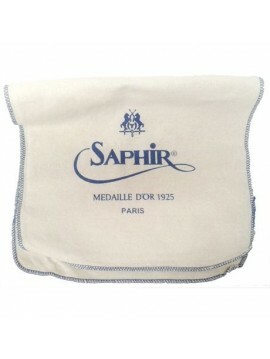 Saphir Renomat provides an in-depth cleaning of smooth leather to remove buildup of silicons, resins, and dirt that accumulate over use, thereby preparing leather to receive the full nourishment offered by Saphir's Medaille d'Or products. 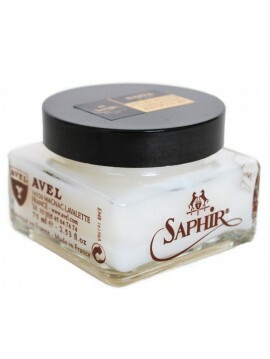 It can also be used to remove darker polishes that may have mistakenly been applied. Cream based on beeswx and neatsfoot oil. 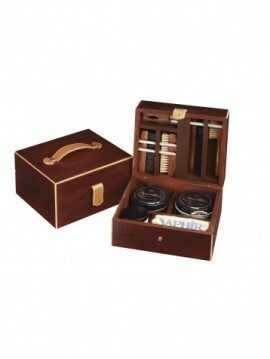 Preserves the specific properties of Cordovan leather (very tight leather pores) while nourishing and protecting it. Download here available colors. 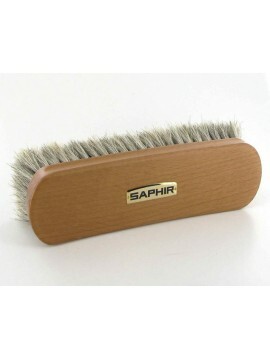 Stunning brushes by Saphir in soft grey natural horsehair with varnished beechwood handles. 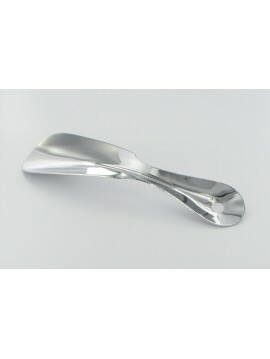 Ergonomic ridged sides for ease of use. 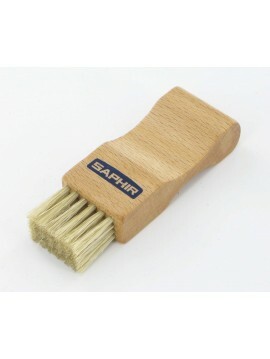 Perfect for removing dust or residual dirt from unpolished leather or even for brushing clothing! 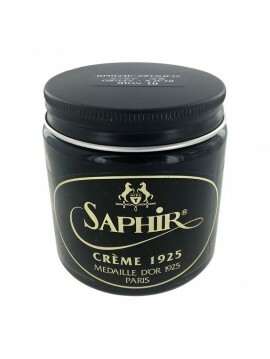 Saphir Universal Cream Polish is a neutral polish used for the care of smooth and varnished leather, reptile leather, shoes, furniture and other leather goods. 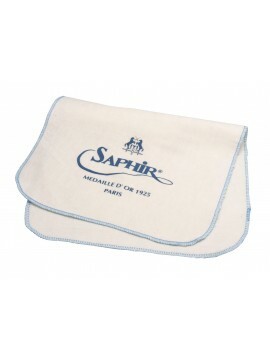 It gently cleans, nourishes and protects without clogging up the leather or leaving behind a white residue. 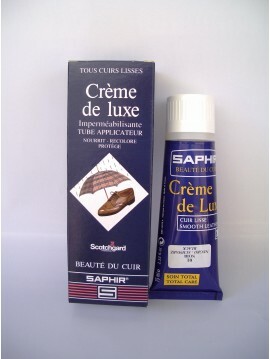 Shoe Polish cream 50 ml/1,69 fl.oz. 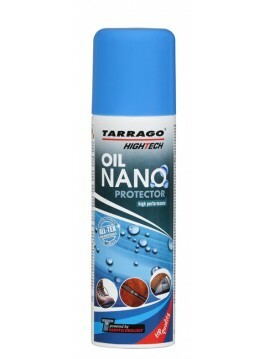 High Tech Nano Protector 250ml. 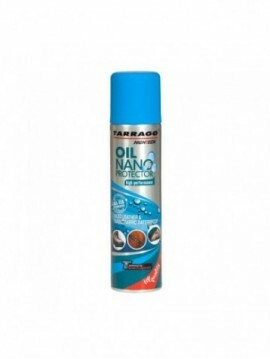 High Tech Oil Nano Protector 400ml. 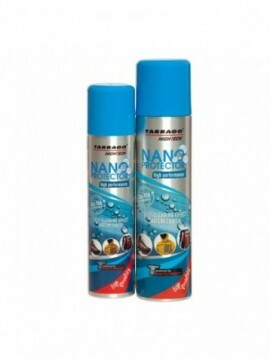 Cleans, refreshens the colour nourishes and waterproofs. 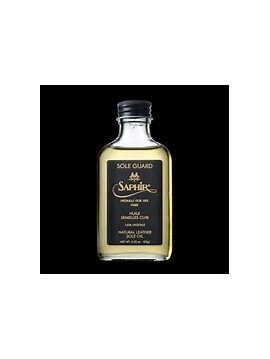 Contains almond oil to preserve the silky appearance of the leather. 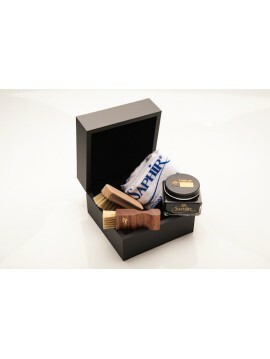 PACK OF 4 PRODUCTS WITH SPECIAL PRICE: Luxury Saphir Medaille d'Or 50 ml., Saphir Medaille d'Or cream refresher 75 ml., Saphir oval polish brush 13 cm., Saphir 9 cm white bristles brush and gift box. Package value separately 35€, you save 10€. 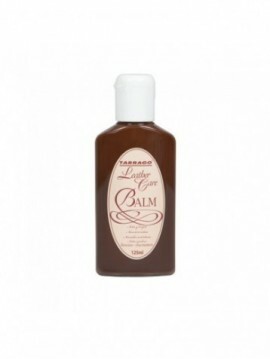 Natural Leather cream 50 ml/1,69 fl.oz. 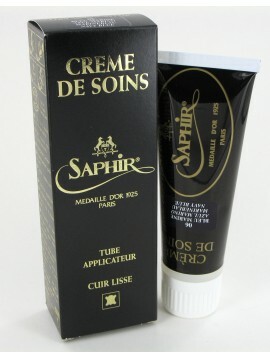 Soft and nourishing vegetal oil-based cream. 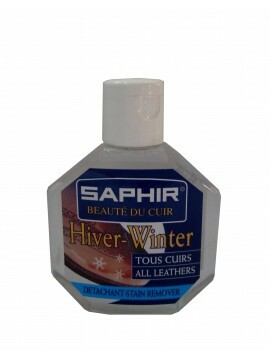 It cleans, nourishes and helps to waterproof the leather.It does not affect breathability. Product tested and recommended for footwear made with breathable and waterproof membranes. 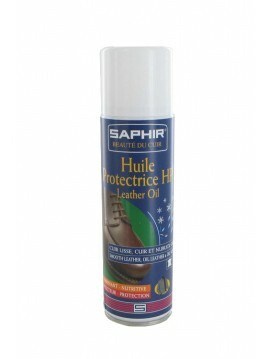 For smooth leather and oiled leathers. 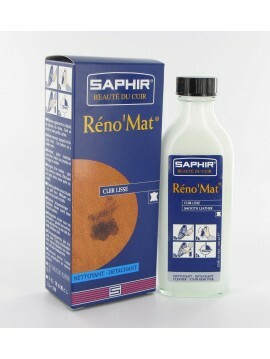 Suede renovator which revives the original color and nourishes by replacing the natural oils lost from the leather. 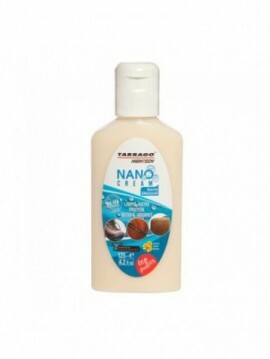 Protects beyond water, respect feet breathability and dries fast.100 ml /3,38 fl.oz. and 250ml./8,45 fl.oz. Clean, recolorea, nourishes and waterproofs. 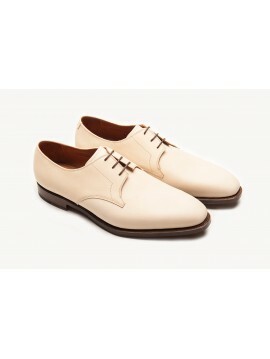 This unique nutritional formula based on almond oil returns to the nubuck its appearance and soft touch. 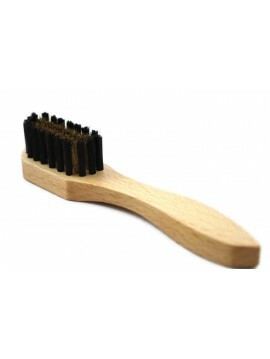 Shoe cream (pommadier) applicator brush in softwood . Just the right size for dipping into the cream polish jars. 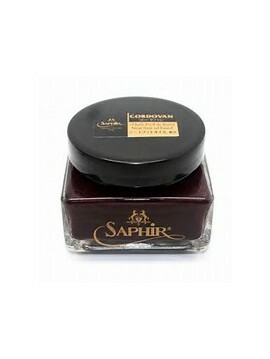 The perfect tool to apply this outstanding polish to difficult to get to areas such as the welt. 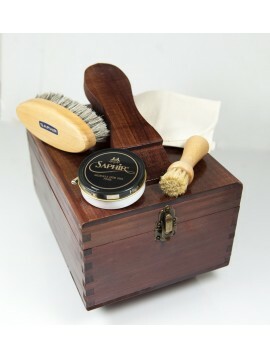 Made from hand waxed softwood. 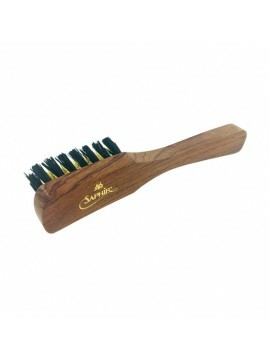 Natural boar bristles and ergonomic shaped sides. 100% crepe natural y madera de Bubenga, pulida y encerada a mano, ideal para limpiar y eliminar el brillo. 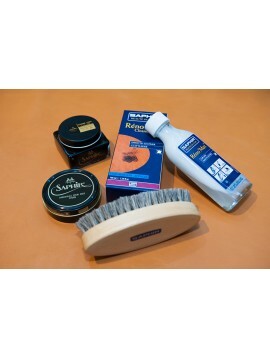 For the gentle cleaning of the suede, nobuck and smooth leather. 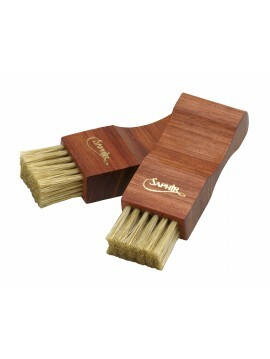 Gives shine to the waxes, by conserving them on its natural bristles, without damaging the stitching. 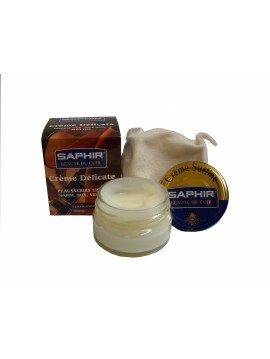 Jojoba oil and wheat proteins: extremely smooth base ingredients used in cosmetic formula. 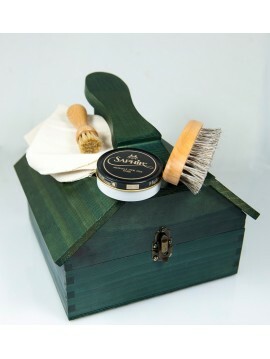 Preserving the finish and appearance of the web, cleanses and nourishes in depth. 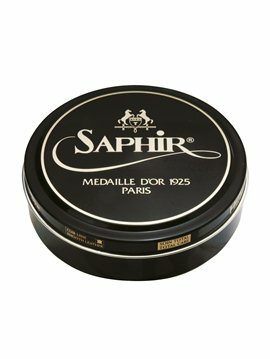 PACK OF 4 PRODUCTS WITH SPECIAL PRICE: RénoMat Saphir Cleaner, Pommadier Cream of Saphir Gold Medal, Saphir Wax Gold Medal and Saphir Chamuza Saphir 100% natural cotton. In the order you must indicate the color of the Pommadier cream. Thank you. 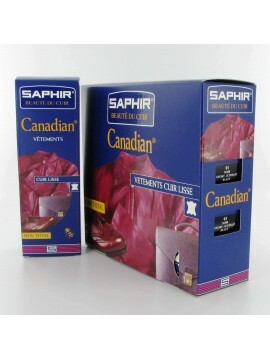 Saphir's CANADIAN is formulated to clean, recolor, soften, nourish and waterproof larger leather goods, such as leather jackets and leather luggage, without rubbing off onto clothing. 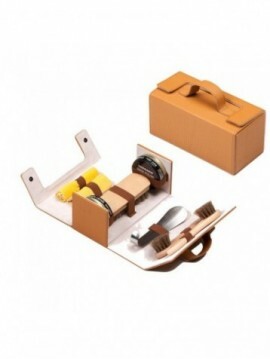 It is a "total care" product that will both nourish and protect the leather. Download here available colors. 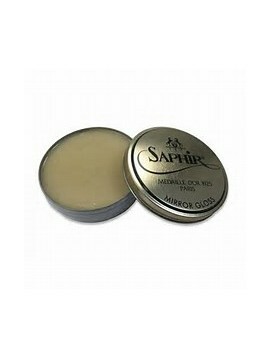 Nourishing cream based on beeswax, preserves youth and flexibility of leather. 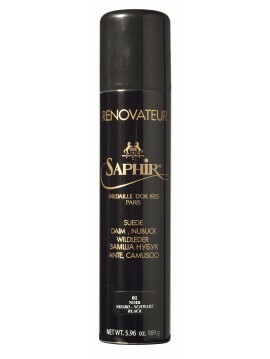 Cleans, nourishes and revives the color permeates. Download here available colors. 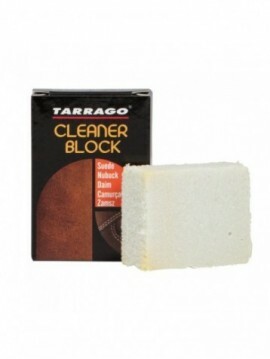 Cleans in-depth and eliminates all traces of dirt. 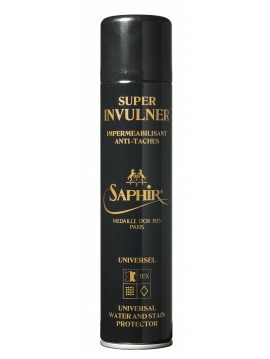 Exclusive formula based on solvent and surfactants. 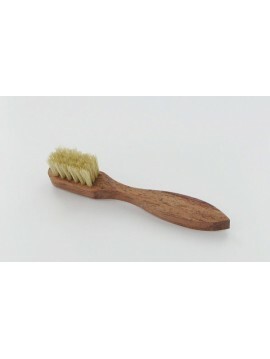 Sold with a brush made of wood and natural bristles. (Can also be for fabric materials). 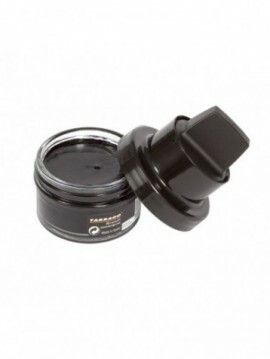 Extra glossy bitumen paste, formulated for glazing . Based d ecera bee , carnauba and turpentine. 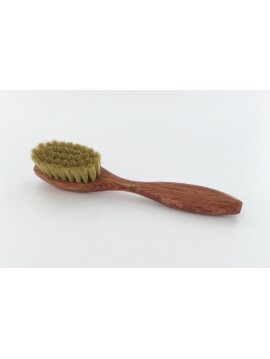 Ergonomic brush with varnished beech handle. 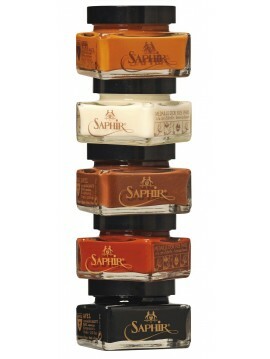 Very practical for applying polish without dirtying your hands. 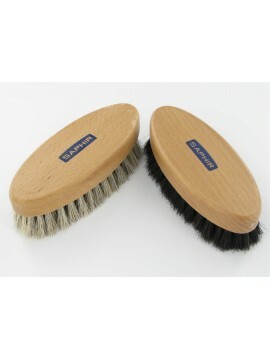 Black or white boar silk bristles. Particularly adapted for the application of the Pate de luxe. 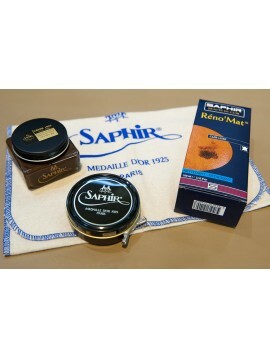 PACK OF 4 PRODUCTS WITH SPECIAL PRICE: RénoMat Saphir Cleaner, Pommadier Cream of Saphir Gold Medal, Saphir Wax Gold Medal and Saphir Horsehair Brush. In the order you must indicate the color of the Pommadier cream. Thank you. 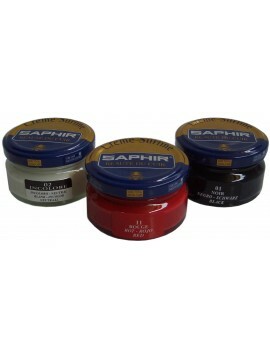 PACK OF 4 PRODUCTS WITH SPECIAL PRICE: Saphir brush with natural and metal hair bristles, Saphir color refresher spray, Tarrago spray protector to prevent wetting or staining and Omnidaim Saphir spot cleaner that includes a special brush. 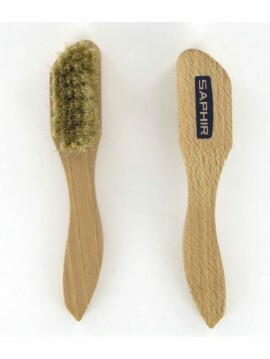 Spatula brush small Medaille d'Or. 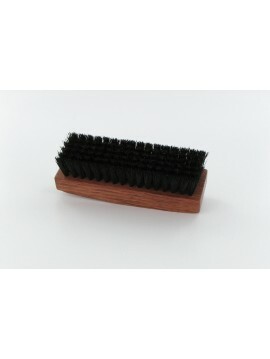 Long handled brass wire and nylon bristle brush for suede and nubuck. Waxed beech wood handle. 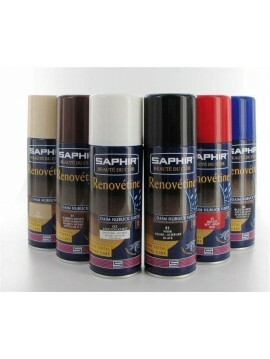 Special cleaner for suede and nubuck leather, crepe and textiles including "tex" fabrics, refreshens the original colour. 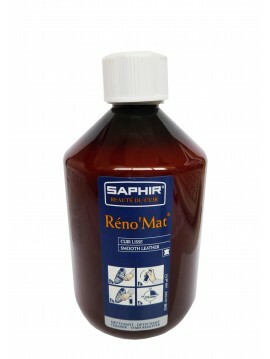 Available in 100ml glass bottle with small suede brush included, or in plastic 500ml bottles (no brush). 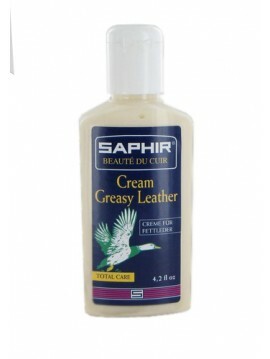 Saphir Greasy Leather Cream is designed to both condition and recolor oiled leathers, such as Horween'sChromexcel. These leathers are infused with oils during the tanning process and are distinguished for their rugged, natural look. Delivered in a box with a 100% cotton cloth. 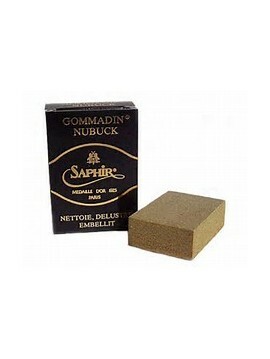 For fine smooth leather, nappa, box, veal. 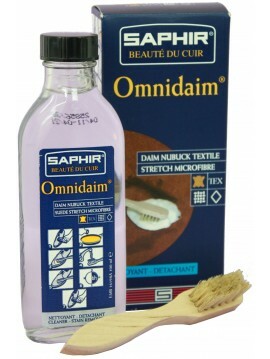 Nourishes, cleans and embellishes. 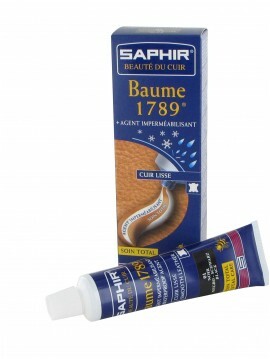 Extremely soft formula which does not alter the leather's appearance and finish. 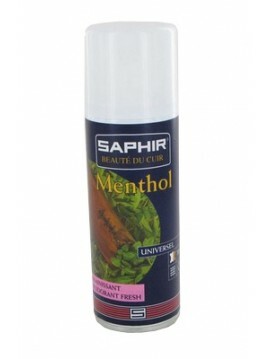 Shoe deodorant which purifies any odours, thanks to its fresh and pleasant scent. 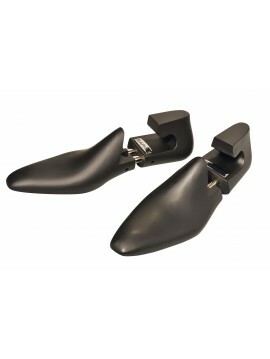 Suitable for all types of dressing, casual or sports footwear. 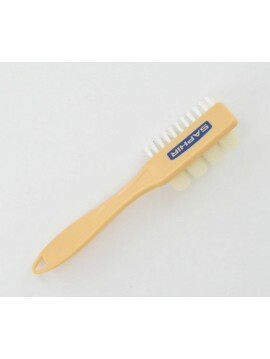 High grade plastic brush for microfibre and nubuck. 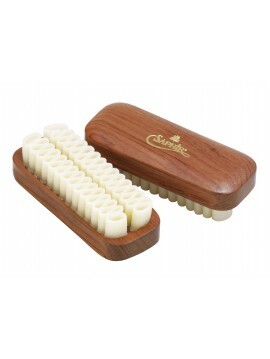 Long bristles for brushing microfibre and crepe brush for suede and nubuck leathers. 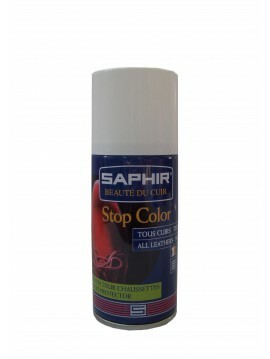 Colour stabilizer which prevents any colour transfer of leather, suede, nubuck or textiles onto skin, socks, tights, clothes etc. Limpiador quitamanchas, elimina la suciedad, resinas y siliconas de los betunes de mala calidad. 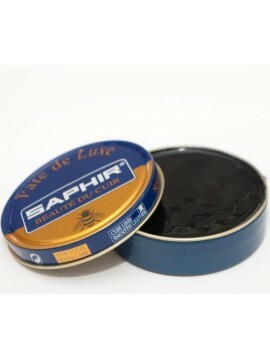 Limpia en profundidad los poros del cuero, permitiendo a las pastas y cremas SAPHIR penetrar y preservar la dermis del cuerpo. Fmula original datando de 1872, a base de 3 tipos de aceites diferentes: vegetal (aceite de linaza), mineral y animal. Nutre, suaviza e imperbeabiliza. 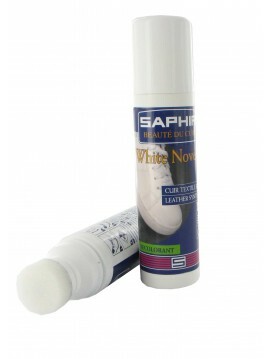 Well-covering shoe polish which whitens, renovates and embellishes sports shoes and trainers. Protective Leather exclusive formula preserves stains : rain, snow , grease, drinks ... and having polishers , recolorantes nutritious qualities. 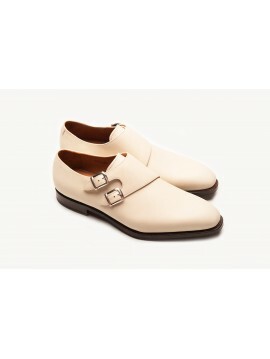 This cream base bee decera highly concentrated in pigments and dyes , once mixed with stripes impermeabilizantea colorless leather returns to its original brightness . Download here available colors. 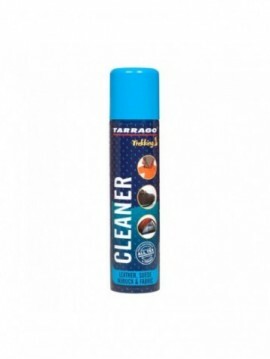 Trekking Cleaner colourless 250 ml / 8,45 fl.oz. Dry cleaning mousse to clean Trekking footwear without water. It makes leather soft to the touch. Does not affect leather natural breathability. Product tested and recommended for footwear made with breathable and waterproof membranes. 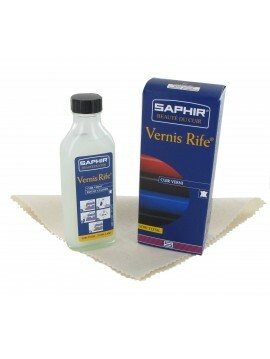 For leather, synthetic leather, oiled leather, suede, nubuck, fabric and micro fibers. Sport Cleaner colourless 75 ml/ 2,54 fl.oz. 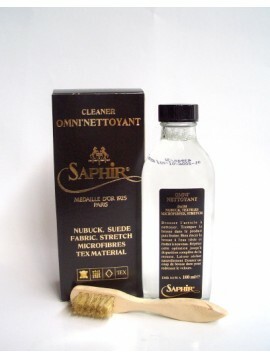 Cleaning erasure that easily removes dust, dirt and stains from the surface of the shoes, bags and garments. 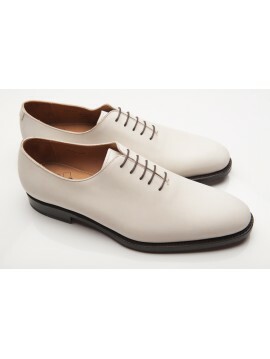 Suitable for suede and nubuck. Unit net weight:35 grs. 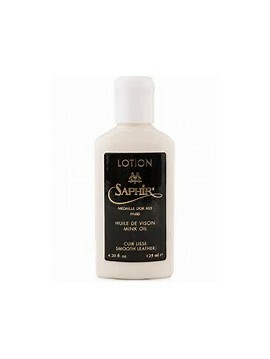 Self Shine cream kit 50 ml/1,69 fl.oz. 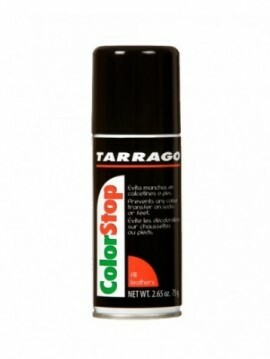 Fixes the color of the interior of the shoes, avoiding colro stains in feet or socks. 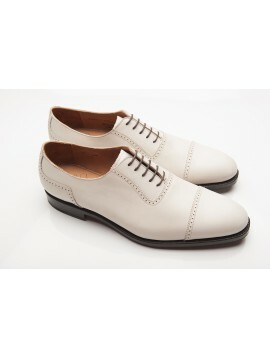 Suitable for all kind of leather. 100 ml./3,38 fl.oz. In Sanchez, since 1978, we look for our client, based on a sincere and professional relationship. The satisfaction of our customers is our guarantee.